Foldable Straining Basket – Welcome to Cool and Crazy Gadgets! With the handles situated far away from the heat of cooking, steaming, boiling or frying food you are sure to keep you hands cool at all times. In a simple motion the handles lift up and allow the water from the basket to be strained right away. Now you’re ready to serve right away! Have you always risked your hands being burned by hot cooking oils? Well now frying has never been so quick, easy and burn free! Whether you want to fry chips, chicken or even Mars bars (if that’s what you like!) then you’ve found the device that makes it easy for you. 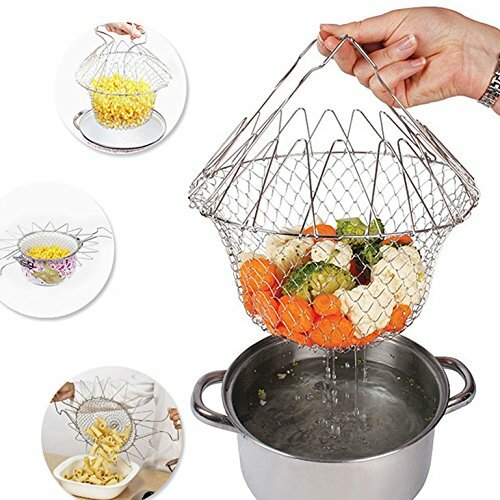 Are you also looking for a colander, steamer or cooking basket? Then look no further! With its highly versatile and flexible design in an instant you are able to change your strainer into all four of these utensils for the price of one! Cast from high grade 304 stainless steel, the basket is extremely resistant to rust and will always remain bright and shiny. It’s highly flexible design allows you to fill your whole pan or cooking pot with ease, ensuring and even straining throughout. The handles also act as legs and allow you to store ingredients ready to be cooked. A storage unit that is both practical and hygienic all in one place. Say goodbye to transferring to pans as you’ll be all ready to go!